All members are encouraged to organise trips. So if there is a trip you would like to do and there is not one already being organised, then why not organise one yourself? If you need help then ask one of the more experienced members for suggestions, ideas or help. Look at the Surf or River trips pages for ideas of where to go and where to stay. What sort of trip do you want to do? Flat water, easy white water, surf, multi-activity. Who will be able to come on the trip? Is the trip suitable for beginners or novices, or is this trip solely for 'Team Extreme'! Where are you going to stay on multi-day trips? The internet is a great way to find campsites, bunkhouses, B&Bs near to where you are going. Or look at the list of recommended accomodations or ask other members. Probably by car! Do you have enough car drivers on the trip with all important roof rack? How many people are they willing to take in their car? Do you have sufficient experienced and competent paddlers able and willing to lead, coach and ensure safety of the group? If not you may have to change your plans. If you are unsure then ask more experienced members of the club. Let everyone know the expected expenses involved in a trip. For example if you are planning on doing a BCU course provided by an outside company, how much extra will this cost above other normal expenses, (shared petrol costs, accomodation, food and beer money). How do I advertise the trip? Use the club email distribution list to tell everyone about your planned trip. All members are added to the club email distribution list and can email the group using batterseacc@googlegroups.com. Add the event to the club calendar on this website. If you have not amended the club calendar before then look at the instructions of how to update it. It is worth checking that your planned trip does not already clash with other events. What will the conditions likely to be? Check with an experienced paddler as to the suitability of the planned date in terms of expected conditions. (e.g. Not many UK rivers have sufficient water in them to paddle them in summer months. Surf is more likely in Spring or Autumn and maybe too cold for some in mid winter). White Water courses are usually open all year. What are the alternative paddling, or other outdoor activity, options in the area you intend to go to, or on the way there or back from London? Sometimes you can be unlucky and the conditions are not good for the planned activitity, (e.g. Too much rain and the water levels may be too high for the planned section of river to be paddled by the group or some of the group. 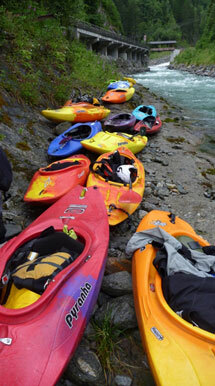 Too little rain may mean that none of the local rivers are worth paddling). Rather than going home after a long drive to get to your destination, most people would prefer to do some other type of outdoor activity, (e.g. walking, biking, climbing, surfing, visit ww course on way back to London). Have you got access to the container in order to get the necessary club kit? Are there any access issues with the proposed section of river? It is worth finding out about any potential problems with access to the section of river that you want to paddle. This can be done by checking with the Local Access Officer or by looking on the UKRGB website for details. When should I get money from people for accommodation? It would be wise to get money for accommodation from everyone in advance, either the full amount or a deposit. Plans change and people can drop out at the last minute! You will almost certainly have to pay a large deposit or the full amount in order to book the accommodation. How should I match cars and passengers? Find out from the car drivers how many passengers they are willing to take, what time they would like to leave, how many boats they can take, do they need to go via the container to pick up club kit, where they will be leaving from. Find out from passengers what time they can leave and from whereabouts. Some people may be able to leave work early, whilst others cannot leave till late on a Friday evening. It helps if people are flexible in their plans. Once you have replies from everyone you can suggest a plan of who goes with who in which cars.